2 dried Asian dried red chili or 1 tbsp. fresh jalape'o pepper or 1 tbsp. Italian red chili flakes. * Note in all the instances above---remove the seeds before adding to the pot! Cut the peaches in half and remove the pit. In a pot of boiling water, submerge the peach halves for 30-40 seconds. Remove the peaches and dunk them in ice cold water to release the skins. When cool remove skins with your fingers and place the peaches in a bowl. 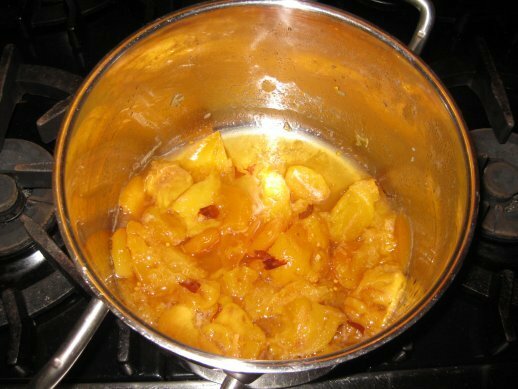 Combine the salt, sugar, cider vinegar and water in a non-reactive sauce pot (stainless steel, enamel or Pyrex) and bring to a boil. 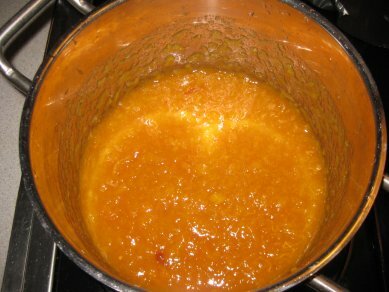 When the sugar has dissolved and the mixture has boiled, add the peaches, apricots, ginger and chilies. Return to a boil, reduce to a simmer and cook slowly for 40 minutes, stirring every 5 minutes to prevent sticking. Some foam will come to the top of the cooking ingredients, so just remove it carefully with a spoon and discard. The cooked peaches ready to puree. Remove from the heat and cool until just warm. 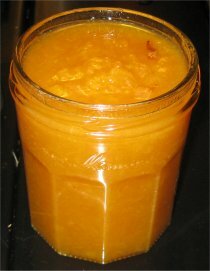 Using an immersion blender or food processor, puree until almost all of the ingredients are chopped fine but not totally pureed. Place in a storage container and refrigerate over night before using. Use this sauce as you would with any barbecue sauce. The most common way is to apply it when the meat is done and 10 minutes before serving. Brushing the meat with the sauce and caramelizing it slightly on the grill. The BBQ Sauce in a jar for refrigerated storage for up to 3 months.